I tried to make this work before, but I just dropped the whole thing relating to sill and head height and kept making the family without using my own shared sill and height. I made a whole new window package. All parts are made in generic category then the frame, sash, and glaze is nested together, then that is nested in a parent family with trim, pair and/or ganged etc. Everything all works great and love it having better control. So now, I'm ready to tackle this problem and would like to figure out how I can solve it. I made a dumb family to test it out and see if I can figure what I'm doing wrong with just the void and using my own shared sill and height. For whatever reason it's not working when I try to change the height. It doesn't matter if I use the opening or void. OR also using either window category or generic category. Any help would be great. As you can see in the pic, this is generic and the elevation says 3', but when I input my sill to 5' nothing moves. When I change the elevation, the window moves, but not the my sill parameter. I'm sure I'm missing something small. This is my windows family in the schedule and you can see the "ganged" window which is the single window family is reporting the correct sill height, but the actual shared nested window size is reporting in the negative? In reality the "ganged" part will be hidden from the schedule. Sill height/head height (head is not reporting correctly either) is the revit native, the win sill height is my shared parameter. Assuming you use custom head and Sill parameters (as I do in my window families) the head and sill problem is simple to fix. Use the Pick Line setting and select the Ref Level. Select this new ref plane and enable the Defines Origin instance parameter. Dimension between this new ref plane and the ref level and lock it, it should say 0. 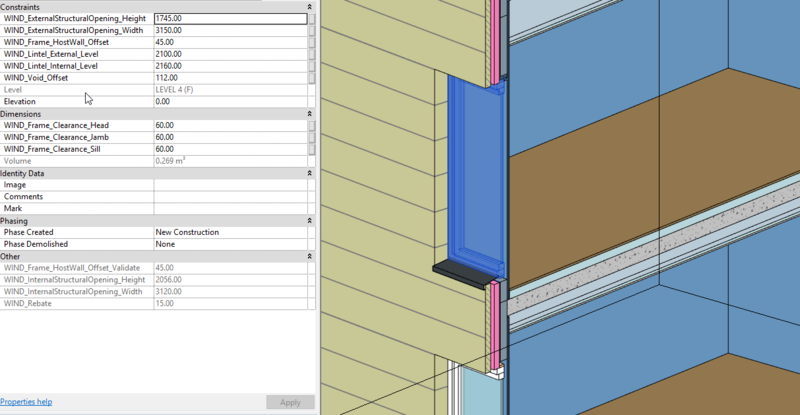 Move the lowest end of both parameterized dimension for head and sill onto the ref plane instead of the ref level (use tab to cycle and pay attention to the status bar in the bottom left of the Revit window). Each time you do 5 the parameter will become unassigned so you will need to reapply it from the ribbon. Reload the family into the project and the values should report correct. You can’t use both parameters. You can set it up so your Sill SP parameter controls the placement but then the OotB Elevation parameter has to be at zero relative to the level you want the Sill parameter to report from. The problem here is that there’s no way to keep from editing the Elevation parameter. The model can look right and report incorrectly. I haven’t had to do this yet but my knee jerk would be to have the Sill SP not control placement. Let Elevation control placement and use Dynamo (or a manually edited schedule) to copy the value from Elevation to Sill. You don't need to use the elevation parameter at all, I just described what you need to do ignoring the default parameters (iirc I unassigned them in my families) for custom SP's. Awesome! Thank you. I thought it would be something simple that I overlooked. This worked great. Now gotta update all windows family! Greg, I'm not going to be using the OOTB parameters and use my shared parameters instead. I also don't know how to use dynamo yet. No, you don’t need to use the Elevation parameter. But, if it gets used, even accidentally, it screws up the other system. If someone aligns the window vertically you’ve just lost control over your parameter. If you’re confident your team will never do this, or any other number of translations that affect the Elevation parameter, go for it. Or, you could have the window move vertically in only one way and capture it manually when ready. Up to you! Scheduling the elevation is a simple method to highlight if any errors have been made though I'm sure a dynamo graph could be put together to set them all to Zero. I noticed that when I was playing around with moving it up and down, aligning it. I was able to use the schedule to bring it back to zero and adjust it at the same time. Just for the sake of this conversation. How do you have yours set up? Sill and Height wise? Last edited by sknsnw9; August 29th, 2018 at 07:18 PM. Until very recently, I never bothered since everything I did was curtain wall. But I'd probably start with the assumption that windows need to have their sill height noted in a schedule. Not because I don't think it should be there but because the software makes it a manual effort to be sure it's correct. Once I lost that battle (wink) I'd lean into the example I gave before so that I only had to worry about one parameter rather than two. In that case, my windows would come in with their sills at whatever Default Elevation was in the family and I'd push the Elevation parameter to a SP for scheduling and tagging. With both the Elevation and your SP controlling the height of the window you have to verify which windows have their Elevation set to something other than zero (cause someone moved it) and readjust it back to zero while also modifying the SP parameter to match the design intent. If you have good faith in your team that they won't use the Elevation parameter (like ever) then the SP approach works like a champ. I don't have that level of confidence in myself, let alone my team! Last edited by GMcDowellJr; August 29th, 2018 at 07:30 PM. Ive never (personally) understood considering Sill Height or Head Height to be properties of the Window TYPE, in practice. I buy the same Single Hung Window whether i install it with the Sill at 18" or at 24" in another room. Scheduling Sill and Head Height by Type is silly, to me. They are all Instance Parameters in my Window Library. The same issue still exists between the Sill Height/Head Height/Elevation parameter, but we have a Dyn Graph that cleans that up, just in case theyve been used. But- as the windows are schedule by Type- that information isnt in the schedule anyway. Its in an Elevation View somewhere. But thats just one persons opinion.